Violinists and violists no longer have to "take it on the chin!" The Chin-Chum, a cushioned, ultrasuede padded chin rest cover, slips over the cup of the chinrest and protects the player from "violin hickeys". The Chin-Chum also protects the neck from the chin rest's metal clamp. Small: 1/2-1/16 violin; 11"+12" viola. Violinists and violists no longer have to "take it on the chin!" 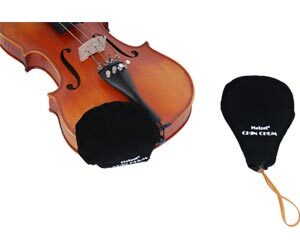 The Chin-Chum, a cushioned, ultrasuede padded chin rest cover, slips over the cup of the chinrest and protects the player from "violin hickeys". The Chin-Chum also protects the neck from the chin rest's metal clamp. Medium for 4/4,3/4 violin, 13"+14" viola. Violinists and violists no longer have to "take it on the chin!" The Chin-Chum, a cushioned, ultrasuede padded chin rest cover, slips over the cup of the chinrest and protects the player from "violin hickeys". The Chin-Chum also protects the neck from the chin rest's metal clamp. Large for 4/4 violin, 15" and up viola.